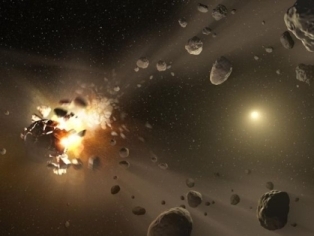 We've know for a while that the Earth and Moon were subjected to one almighty bombardment about 3.9 billion years ago, some time after the formation of the solar system. it's always been my contention that this 'late, heavy bombardment' was the celestial battle spoken of by Zecharia Sitchin who outlined an alternative history of the solar system from the one provided by mainstream science. 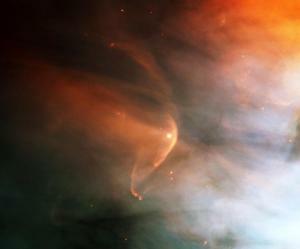 Now, new evidence has emerged to show that this bombardment took place over a much longer period of time than previously thought - perhaps as long as a billion years. How could this be possible? Two words spring to my mind to explain such a long and sustained bombardment: 'Debris Field'. It seems highly probable that the Earth must have been passing through a colossal debris field over a protracted period of time. Consider: When we get meteor showers, the meteors are a collection of minor debris from a destroyed comet arranged in a massive cloud that the Earth moves back through annually. Hold onto that thought. moving through a cloud of debris left over from one almighty collision prior to 3.9 billion years ago involving, presumably, a destroyed rocky planet. If so, then the field of debris has since completely dissipated. For Earth to be moving through that field of debris over time implies that the Earth was somehow involved in that initial collision - it was essentially re-visiting the scene of the crime every year, enduring another massive pummelling until the field of debris had dispersed through the Earth's gravitational action over time. Either way, the Earth's and the solar system's history is not as we have been previously given to understand it. I think that this new evidence requires a major planetary collision to have taken place in the inner solar system about 3.9 billion years ago, possibly along with a significant migration of Earth, likely to have involved another unknown planet. This seems to greatly strengthen Sitchin's theory explaining the catastrophic events of the early solar system. Planet X Return in 2017? I was sent a carefully prepared document by a Christian researcher named Robert Codell this month about the return of Planet X. He ties such a return in with the possible Second Coming of Christ, and offers October 2017 as a projected date for the reappearance of the 'red star' in question. How has he come to this rather startling conclusion? Is it something we should take seriously, and prepare for? "Based on 2 confirmed Planet X events being Noah's flood (1656 AM) and the Exodus out of Egypt (2448 AM), we can try to predict its orbital period and possible return to earth. In 33 AD at Christ's crucifixion, there was darkness over the land for 3 hours between the 6th & 9th hour. This can't have been a solar eclipse as they don’t last for more than about 7 minutes of totality so we expect this same event happened at this time to block out the sun for this length of time - obviously from a safer and more distant orbit. Also a total solar eclipse cannot occur during a full moon which is what the Jewish Passover always falls on. "I have tried using various orbits like the obvious 792 years (2448-1656) as well as factors of it like 396, 264, 198 etc. but found the period of 396 years worked very well with little adjustment to match all the events above. I added a small amount of orbital decay (speed decrease) which amounted to about a 2 month longer period for each 396 year cycle. Personally, I'm not convinced of the Flood date being within Biblical times (there's really no actual evidence for such an event in historical times). I am also sceptical of the Exodus story in general (because of a lack of evidence for this in the Egyptian historical records), and certainly as a marker for a Planet X intrusion (which is a later adaptation of velikovsky's work). In correspondence to me, Robert argues that the classic orbital period of 3600 years for Nibiru is likely a misinterpretation on Sitchin's part, and a figure nearer 360 a better fit (2), an argument partly based upon the work of amateur astronomer and Planet X researcher Gil Broussard. I've also often pondered the merits of the linking of the numerical 'Shar' to the orbital period of Nibiru by Sitchin, which seems to me to be more of an educated guess than an unequivocal fact. However, any variation from that figure would most likely need to be in the upward direction to accommodate the self-evident lack of evidence of a sizeable extra planet located within the planetary zone of the solar system. Slashing the orbital period to 400 years or so places this planet into the Kuiper Belt, making it a very strong candidate for immediate detection, and if a return date of 2017 is considered, then it should be clearly apparent to the most amateur of astronomers by now. However, if this object was more like a regular comet than a planetary body, then this could work. I think that there may be some merit in considering the Crucifixion event as a possible Nibiru transit. 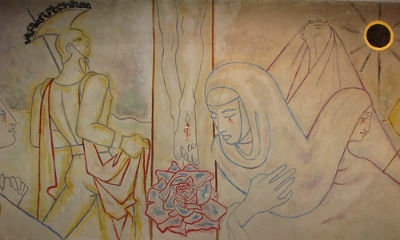 Dark Star symbolism is apparent on artworks about the Crucifixion, both ancient and modern (see images right). Sitchin's original timings incorporated the return of the Sumerian god Anu in 3760BCE, as well as a Flood event projected back to about 11,000BCE. If he was right about 3600 years as the orbital period of Nibiru, then the last appearance of this enigmatic body should have taken place around 160BCE. This takes us into the territory of the awaited Messianic Star. 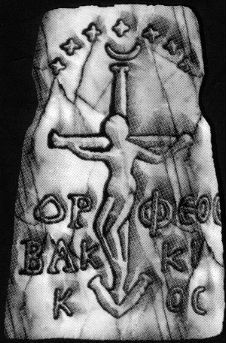 Given the way that Nibiru is otherwise connected to the beginning of calendars (that 3760BCE date links in with the Jewish count of years and the Calendar of Nippur), then it's reasonable to suppose that the advent of Christ might also fit with the Return. Let's say that Robert's assumption about the date of the death of Jesus of Nazareth is accurate at 33CE, then we might have an orbital period of 3792 years. 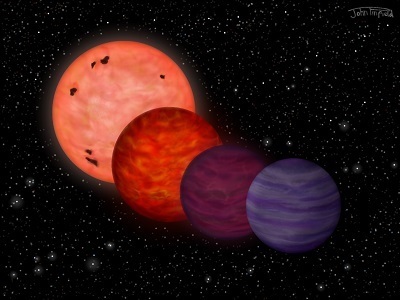 This would then mean that Planet X is not far beyond apogee in its orbital path - a long way from us indeed! Although some of his criticism of the ancient astronaut hypothesis is well-placed (he quickly reviews von Däniken, Zecharia Sitchin, Scott Alan Roberts, Philip Coppens, R.L. Diane and the Reverand Barry Downing), his arguments take on an unexpected passion, bordering on antipathy. He is particularly scathing of Erich von Däniken, falling just short of accusing him of fraud (pp140-1). Peters focuses his arguments upon von Däniken's reappraisal of the origins of many ancient monuments. Although this is a significant segment of von Däniken's work, even without such 'evidence', his theories still merit consideration. But von Däniken falls into a general trap, Peters says, whereby myths about ultra-intelligent alien species "reveal the implicit dimension of religion built into the scientific mindset" (p174) and therefore also the mindset found generally within Ufology. So, Peters argues that von Däniken's work is pseudo-scientific, based upon a "scientized viewpoint" which, in any event, is poorly executed and wide of the mark. Personally, I think this is over-simplifying the role of science. Our modern perspective, which von Däniken and others draw upon to reframe ancient literature, is built upon a far greater tableau of understanding than just science. Further, Peter's understanding of the ancient alien hypothesis has it that such theorists believe that God is an alien (p269), which, again, is not my understanding of their position at all. Such thinking certainly doesn't figure into my own ventures into this subject, nor my reading of many books on the subject. Furthermore, I take issue with his portrayal of the ancient alien movement, such that it is, as some kind of pseudo-religion. In my experience, there is far too much ambivalence and inertia within said 'community' to warrant such a grand label - and a good thing too. Peters over-interprets enthusiasm for an idea with quasi-religious zealotry. Where's the evidence for that? Von Däniken's Church of Latter Day Aliens? Where are the religious rituals of initiation, of promulgation, of conformity here? There is none of that. My teenage children have a vague notion of the ideas I'm interested in, but have thankfully not been subjected to the childhood of indoctrination that they might have expected from orthodox religious parents. So, how is any of this akin to some kind of new religious movement? It isn't - and I suspect Ted Peters knows it. But, for whatever reason, the concept of ancient astronauts really gets under Ted Peters' skin and, unfortunately, his resulting rhetoric becomes prone to exaggeration and distortion. 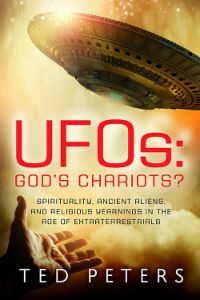 (I wonder whether this is the area of Ufology which is most threatening to his religious sensibilities? He provides evidence later in the book that religious beliefs are not threatened by the discovery of ETI, contrary to popular assumption (pp265-7) - although perhaps a later post-ETI-disclosure generation, once fully adjusted to the new reality, might form a different perspective in time). I was on Aquarian radio on 16th August discussing how Ancient Astronaut theorists are unfairly stigmatised as cultists, and subtle language is used to try to keep us in our box (this picked up on the review discussed above). We subsequently had a broad and lively debate about cults, government power and spying, the new rise of Germany, the importance of sci-fi in getting the message across, and ... scotch eggs. "08/16/14 ~ Hosts Janet Kira & Dr. Sasha Lessin interview authors/researchers Andy Lloyd, Glenn Bogue and Chris Berman on the Alien Contact Organization, Saturday, August 16, 2014 from 9 to 11 AM on www.blogtalkradio.com/aquarianradio. ANUNNAKI PANEL ON NIBIRU, NEMESIS, GALACTIC POLITICS AND EXISTENCE ~ ANDY LLOYD, DR. SASHA LESSIN, JANET KIRA LESSSIN, GLENN BOUGE, CHRIS BERMAN, in a wide-ranging, matrix-busting discussion interspersed with directed visualizations, discuss how the sun’s binary-system partner Nemesis , Nemisis’ planet Nibiru and the moons of Nibiru affect us on Earth. The panel explores the simultaneous embrace of both unity and division." 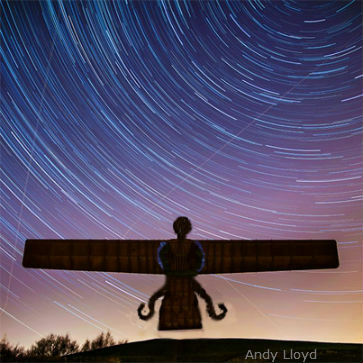 One of the regular contributors to the Dark Star Planet X forum, Wayne James, noted recently the similarity between the monumental artwork 'Angel of the North' near Gateshead in Northern England, and ancient Mesopotamian Winged Disk symbolism (e.g. Ahura Mazda, Shamash, Ashur) (1). I think he might have a point, given the remarkable wingspan of the statue compared to the central angelic figure. All that's missing are the central solar circle and the two ureus swirls. Just for a bit of fun, I've used an online Photoshop package to create such a spectacle - a Winged Disk of the North, if you like (right). It's a bit of an amateur job, but you get the idea! This was almost certainly not the symbolism designer Antony Gormley had in mind, according to Wikipedia (2), but I rather like the idea nonetheless. Thanks Wayne! 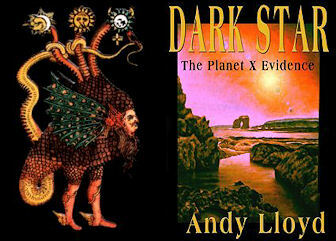 Thanks to everyone who has visited the Dark Star Theory website over the last 15 years. This month saw the millionth visitor - my good friend Simon 'The Emperor' Faulkner wins the prize - he clicked on the page nine times to make sure he was number 1 million. Quite apt, really, as he was the person who originally suggested the moniker Dark Star. Anyway, it's still up and running and maybe will make another 15 years? ?